How many of the more than 40 million people who pass through Times Square every year hang out somewhere before or after (or between) Broadway shows? Broadway stars certainly do — at favored bars and restaurants, but also in plazas and parks, a bakery, and one special bookstore. 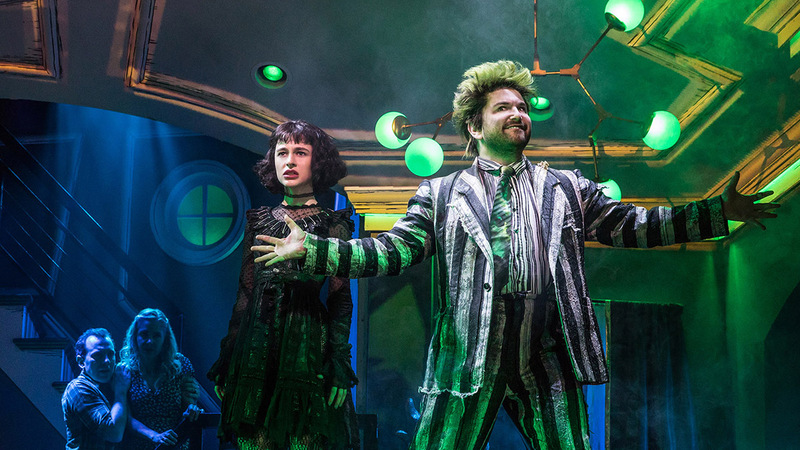 These — plus a few hotel lounges, rooftop pubs, candy emporiums, even one spacious theatre lobby — can be good places to visit when you hit the theatre. Lin-Manuel Miranda, the star and creator of Hamilton, used to hang out at the Drama Book Shop (250 West 40th Street), a fact that would not be as famous had a water pipe not burst in the store on Valentine’s Day, destroying its most valuable merchandise. Miranda took to social media, recording a video urging people to frequent the store and buy books from its website in order to save it. “I wrote most of In the Heights in the basement,” he said at the time. Many responded, and the shop has recovered, in time to celebrate its centennial in 2017. Miranda had an unusual arrangement; not everybody is allowed to bring their laptop and use the piano at the location in the basement of the Arthur Seelen Theatre, a space normally used for workshop productions. But it’s a common sight to catch well known performers such as Danny DeVito or Brian Dennehy shopping for books, and theater professionals and students alike sitting on the makeshift but comfortable chairs, spending all day reading. There is not much Broadway memorabilia here: For that, there are stores including Theatre Circle in Shubert Alley. But there are regular events and book signings with famed playwrights and other theater artists. There will be a discussion with the cast and creative team of Arthur Miller’s The Crucible, for example, on Thursday afternoon, June 2, 2016. 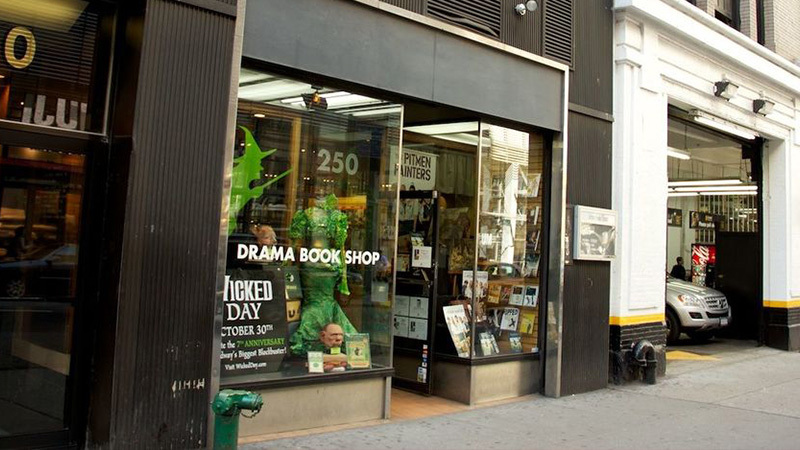 All Drama Book Shop events are free and open to the public. Even if Broadway stars no longer frequented Sardi’s (234 West 44th Street), diners would still be surrounded by them. The walls of the restaurant, which dates back to 1927, are covered with hundreds of caricatures of show-business celebrities. New ones are installed regularly in little rituals involving the honored star and captured by photographers. Sardi’s remains synonymous with Broadway history and tradition: It was, for example, the place where the Tony Awards were first thought up and where for many years the nominations were announced. Broadway performers, not just theatergoers, still frequent the restaurant and bar, especially on Wednesdays between 5 p.m. and 7 p.m. — between their matinee and evening performances. When Joe Allen opened his restaurant in 1965, the cast of a show called Kelly gave him its poster. Allen put the poster on his wall, the show lasted one performance, and thus was born Joe Allen’s famous Flop Wall. All the theater posters hanging on the wall of this eatery are for shows that bombed on Broadway. Joe Allen (326 West 46th Street) is one of some 30 restaurants on 46th Street between Eighth and Ninth Avenue; there are so many that the street long has been called Restaurant Row. You can find several other theater hangouts on that street, including Orso and the piano bar Don’t Tell Mama. Actors, playwrights and other theater professionals have been hanging out in nearby bars and restaurants since the 19th century, as the guides of the Broadway Up Close walking tours will tell you. They point out Keen’s Steakhouse (72 West 36th Street), which has been around since 1885 and proclaims itself the only survivor of what used to be the Theatre District around Herald Square, before the Theatre District moved to Times Square, a few blocks uptown and to the west. Keen’s was an actor’s hangout in the day, and its dining rooms are virtually museums, with 90,000 clay pipes hanging from the ceiling and its prized possession — the actual playbill from the Ford’s Theatre on the night Abraham Lincoln was assassinated there. At the moment, according to Tim Dolan, the founder of Broadway Up Close, who is himself an actor, “everybody hangs out at Glass House Tavern” ( 252 West 47th Street), whether at the restaurant upstairs or the bar downstairs. “It’s frequented by performers more than by Muggles [which is what theater people call anybody who isn’t in the theater]. I remember walking in there one night late and seeing three Tony winners: Tonya Pinkins, Nikki James, and Nathan Lane.” The cast of Hamilton frequents the place after their show, which is a block away at the Richard Rodgers. But, as it turns out, “everybody” doesn’t really mean everybody, as Dolan discovered when he surveyed his 14 guides, all but one of whom are also card-carrying stage performers. Their most popular choice among bars and restaurants (after Glass House Tavern) is Green Symphony (255 West 43rd Street). But there are more than 100 restaurants in Times Square, and you can make reservations at Open Table. And there are places to eat and drink in the neighborhood for nearly every diet and budget — from the kosher steakhouse Le Marais (150 West 46th Street) to Kodama Sushi (301 West 45th Street), which features sushi rolls named after Broadway shows no longer open (Pippin, Mamma Mia, even Spider-Man), to the hole-in-the-wall vegan chain restaurant Blossom du Jour (617 9th Avenue). There are also numerous outdoor food trucks and food stands. It is hard to see how anybody could actually hang out in this tiny cookie bakery, which has just a few seats and is most often filled with a long line of people waiting to buy cookies with names like Funfetti, Chunky Monkey, and Schmaker-doodle. (They also have chocolate chip.) 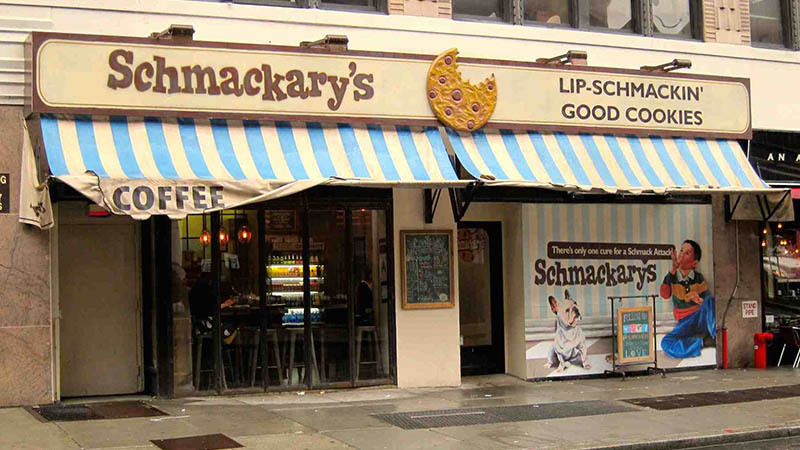 But many theater people voice loud enthusiasm for Schmackary’s (362 West 45th Street), founded by former actor Zachary Schmahl in 2012. One week each year, an impressive roster of fully employed Broadway stars works behind the Schmackary’s counter to raise money for Broadway Cares/Equity Fights AIDS, an event known as Broadway Bakes. The Pershing Square Signature Theatre Center (480 West 42nd Street), built in 2012, is just off 10th Avenue, a short walk from the Main Stem. Its spacious second-floor lobby is not yet a popular hangout, but it should be. Most of the people are waiting to see shows in one of Signature’s three Off-Broadway theatres there, but it includes a relatively inexpensive café, a bookshop that offers the works of the Signature’s illustrious playwrights-in-residence throughout its 25 years, and daily low-key jazz concerts, as well as free WiFi, ample café tables, and comfortable seating. There are frequent free programs there, mostly discussions with the cast and creative team behind their latest plays, but they also hold a regular book club; on June 2, book club members will discuss Patti Smith’s memoir Just Kids. You don’t have to buy a drink or a book or even a ticket in order to hang out in their lobby. But you might consider it. Tickets cost only $25 during the initial run of all their plays, which are written by the most established and most cutting-edge playwrights in America. Bryant Park is a city park located between Fifth and Sixth Avenues and 40th and 42nd Streets, next to the main branch of the New York Public Library. When the weather is good, it’s a terrific place to eat a bag lunch (or order from some of the eateries both in and near the park) and to engage in that most urban of activities: people-watching. There are events scheduled daily. Of particular delight are the free Broadway in Bryant Park lunchtime concerts on Thursdays during the summer, featuring the casts of current Broadway shows. 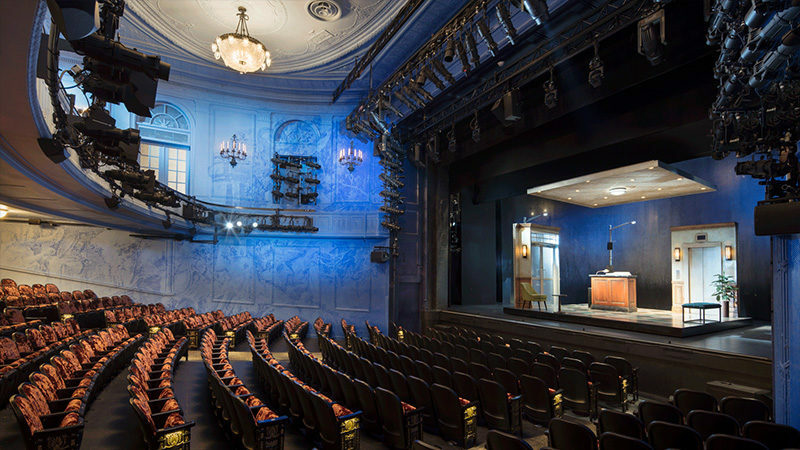 The “Crossroads of the World” has been reimagining itself in the past five years with the aim of becoming what architect Craig Dyker has described as the Lobby of the Theatre District. 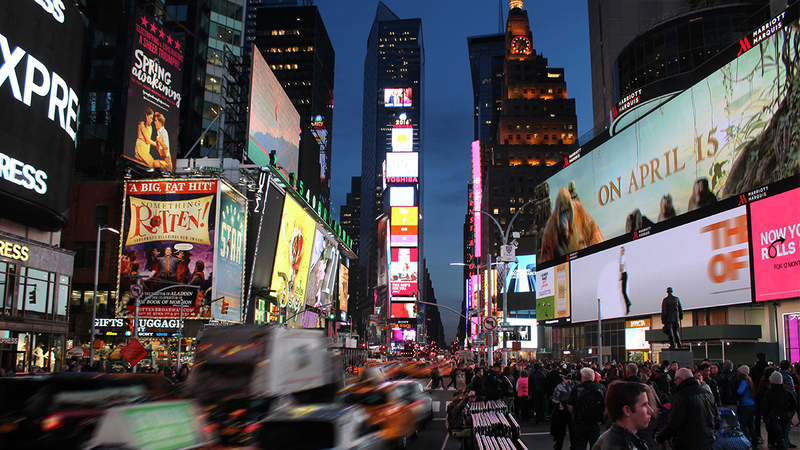 The effort to make Times Square more pedestrian-friendly is a work in progress. New pedestrian plazas have curtailed car traffic, and there are tables and chairs in parts of the plaza for resting. But now some complain about the increased . . . people traffic. Still, the public streets that have been synonymous with New Year’s Eve since the first ball lowering in 1907 are now the sites of several annual summer events as well. 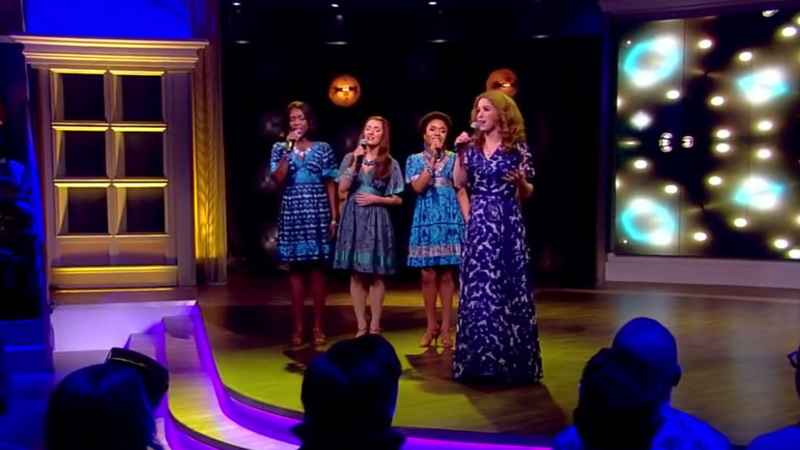 Stars on the Alley, midday on Friday, June 3, 2016, in Shubert Alley, offers musical numbers by the casts of some two dozen current Broadway shows, from Aladdin to Wicked. Taste of Times Square, a food and music festival on Monday evening, June 6, 2016, will offer tastes from some 50 area restaurants. The booths line 46th Street from Broadway to 10th Avenue. Solstice in Times Square takes place this year on Monday, June 10, offering free yoga classes right in the street to celebrate the summer solstice. 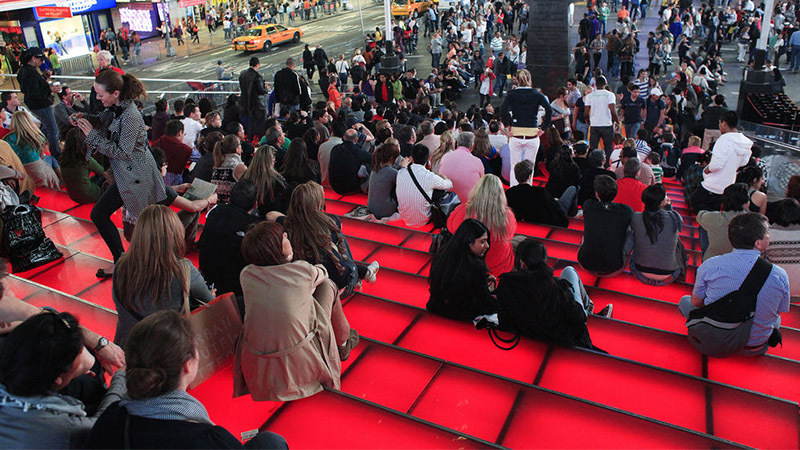 The Red Steps deserves its own place on the list. It rests atop the TKTS discount ticket booth on Father Duffy Square, and offers a close-up overview of the passing show: the dozens of costumed characters, from Elmos to Minions to Captain Americas; the statue of George M. Cohan (“Give My Regards to Broadway”); the Spotlight on Broadway in-ground map made of steel and granite that shows the names and locations of all 40 official Broadway theatres; the people handing out flyers for current Broadway shows often dressed in a costume from the show they’re promoting; the endless towering skyscrapers and gaudy, glorious billboards that let you know you are in the middle of the most visited attraction on earth — Times Square.